RoboTool supports graphical modelling, validation, and automatic generation of mathematical definitions for proof of properties of RoboChart models, with proof automated using model checking. The RoboChart notation is distinctive in its features that support architectural modelling as well as timed constructs in state machines. Resources for the RoboTool and RoboChart Tutorial presented at the CyPhyVerify Spring School are available here. Currently, RoboTool targets Eclipse Neon. While the plugins can be installed on Eclipse Oxygen, this has not yet been tested. If you have docker installed in your machine, you can use this bash script to run RoboTool from docker on Linux. A verion of this script for Mac will be available soon, and the possibility of using docker on Windows is being investigated. 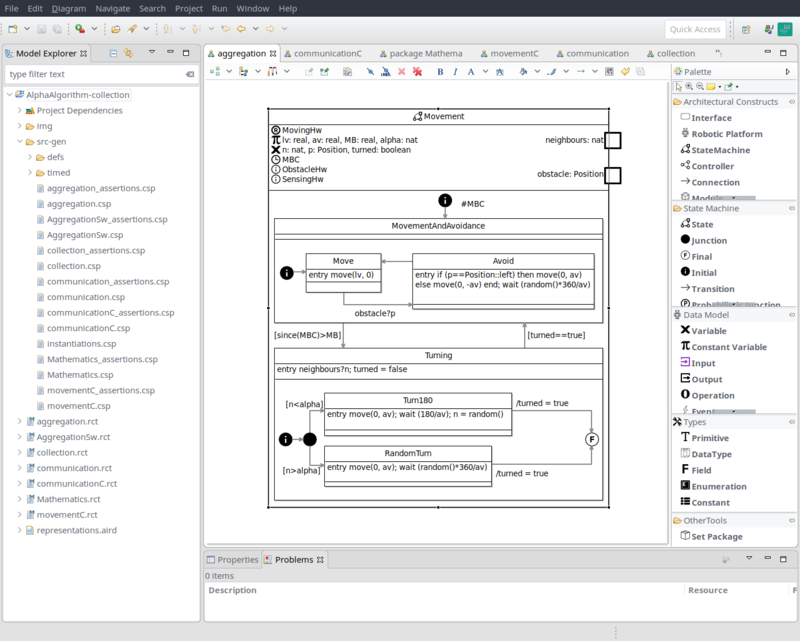 The script downloads the latest image, maps your home folder to the woring directory of the docker image, maps a folder .robotoolsettings to the .settings folder of the docker eclipse installation in order to persist settings, and runs eclipse. The script has a few options (use -h to see the options) to access the container iteratively using bash, as well as to access it as root. Subscribe to the RoboTool announcement mailing list below to receive notifications about new updates.